This year’s edition of BNEF’s long-term forecast sees $11.4 trillion investment in global power generation capacity over 25 years, with electric vehicles boosting electricity demand by 8% in 2040. London and New York, 13 June 2016 – Low prices for coal and gas are likely to persist, but will fail to prevent a fundamental transformation of the world electricity system over coming decades towards renewable sources such as wind and solar, and towards balancing options such as batteries. Wind and solar costs fall sharply. 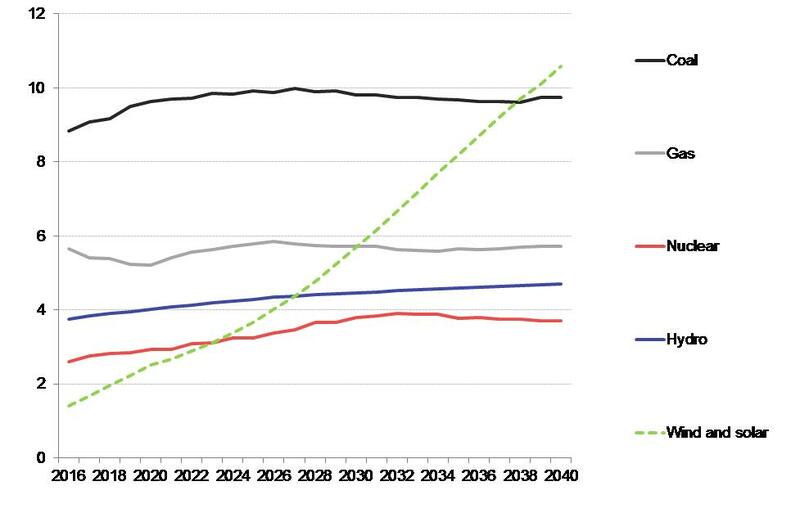 The levelised costs of generation per MWh for onshore wind will fall 41% by 2040, and solar photovoltaics by 60%, making these two technologies the cheapest ways of producing electricity in many countries during the 2020s and in most of the world in the 2030s. NEO 2016 is based on a combination of the project pipeline in each country, current policies, plus modelled paths for future electricity demand, power system dynamics and technology costs. It does not assume any further policy measures post-2020, to speed up decarbonisation. Some 65 specialist analysts worked on the forecast. An executive summary of NEO 2016 can be downloaded by the media from the micro-site on this link.